With the recent decline of the European honey bee, it is more important than ever to encourage the activity of other native pollinators to keep your flowers beautiful and your grains and produce plentiful. 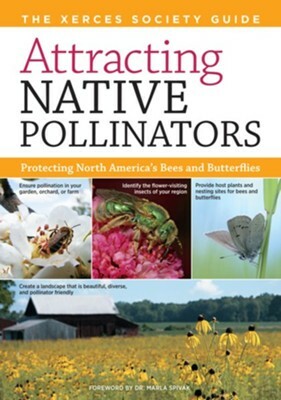 In Attracting Native Pollinators, youll find ideas for building nesting structures and creating a welcoming habitat for an array of diverse pollinators that includes not only bees, but butterflies, moths, and more. Take action and protect North Americas food supply for the future, while at the same time enjoying a happily bustling landscape. The Xerces Society is a nonprofit organization based in Portland, Oregon, that protects wildlife through the conservation of invertebrates and their habitat. Established in 1971, the Society is at the forefront of invertebrate protection worldwide, harnessing the knowledge of scientists and the enthusiasm of citizens to implement conservation programs. They are the authors of 100 Plants to Feed the Bees, Farming with Native Beneficial Insects, and Attracting Native Pollinators. Marla Spivak, PhD, is Distinguished McKnight Professor of Apiculture and Social Insects at the University of Minnesota. She was a 2010 MacArthur Fellow. I'm the author/artist and I want to review Attracting Native Pollinators.